Calks. 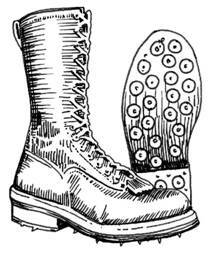 Heavy boots containing numerous steel calks or spikes. 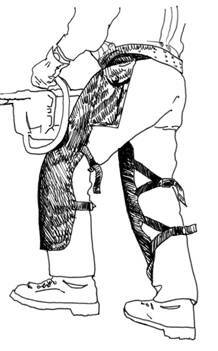 A part of the professional fallers' safety equipment used to promote secure footing. Cant. 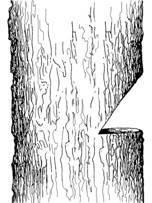 A log with one or more squared sides. Cant Hook. A lumberman's lever that has a pivoting hooked arm and a blunt or toothed metal cap at one end. Cat-Face. 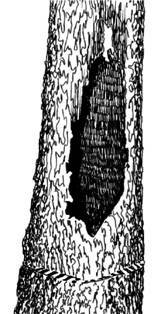 Scar or deformed section at the base of a tree caused by rot or fire. Chain Brake. Safety device which stops the saw chain. Chaining. Removing cut fuels into windrows away from the fireline perpendicular to the slope. Chain Saw. Saw powered by an engine or motor in which the cutting elements are on a circular chain. Chaps. Personal protective equipment which cover the legs from the waist to 2" below the boot tops. All wildland fire chain saw operators and swampers must wear approved chain saw chaps. Clear Cut. An area in which all of the trees have been or will be felled, bucked and skidded to a location. When all the trees in a given area are felled. Compression. The act, process of, or result of compressing. Bind is a result of compression. Competent Person. A person capable of identifying existing and predictable hazards in the surroundings or in the working conditions that are unsanitary, hazardous, or dangerous to employees. Having so identified the situation, this person is authorized to take prompt corrective measures to eliminate them. Conventional Undercut (notch/Face). One of the types of undercut (face) commonly used to fall a tree. The undercut (face) is at least 45° made up of one horizontal cut and one sloping cut that meet each other without overlapping. Corner-Nipping. 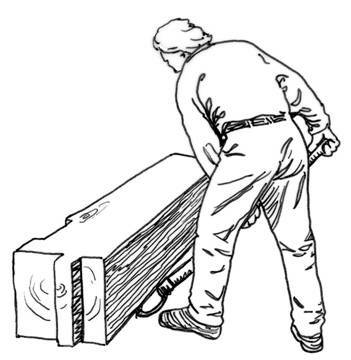 Special technique of partially cutting the extreme outside holding wood corners to prevent root pull, slabbing, and alteration of the desired felling direction. See side-notching backcut. Cutter (feller, bucker, sawyer). One who fells, bucks or limbs trees. Also, the cutting link of the saw chain. Cutting. The process of felling, bucking and limbing trees. Cutting Area. An area in which trees have been, are being, or are about to be cut. Corners. 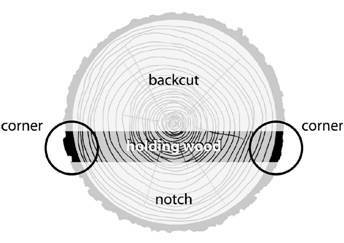 The extreme outside position of the holding wood or hinge inside the bark on either side of the tree. Crossing the Lead. Intentional or unintentional falling of a tree across the established falling direction. Although crossing the lead may be caused by wind, it is usually a result of improper falling technique.